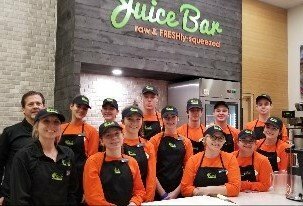 The Grand Opening of Fresh Healthy Café in Millcreek Mall kicks off this Friday, 4/12/19! Join us on Friday, 4/12, for a ribbon cutting ceremony at 11:00AM. The Grand Opening continues throughout the weekend with Fresh Healthy Café giving 10% of net proceeds to the Mercy Center for Women. Fresh Healthy Cafe offers healthy fast-casual food with ample seating, as well as carry-out, delivery, online ordering and catering options. With locations worldwide, FRESH – Healthy Café is the leading global brand in the healthy fast-casual food industry. Innovating the healthy quick-service concept, Fresh Healthy Café specializes in pure smoothies, fresh squeezed juices, and nutritious meals such as protein bowls, wraps, salads, paninis and soups. In addition, Fresh Healthy Café offers gluten free, vegan, plant-based protein and dairy-free options. “All of our food and beverages are made fresh to order using only natural ingredients of the highest quality,” says Kathy Kurpiewski, owner of Fresh Healthy Café. Fresh Healthy Café will also provide delicious and healthy alternatives such as gluten free, vegetarian, vegan, plant-based protein and dairy free. Fresh Healthy Café believes the choices we make today will not only affect ourselves, but our planet as well. All locations are constructed with sustainable building materials and they strive to only provide biodegradable in-store packaging. Fresh Restaurants President & Founder, Jeff Parker explained, “Our commitment to living well extends beyond the four walls of our stores. We're committed to strengthening the local communities in which we live, as well as the planet that gives us life. Fresh Healthy Café is located at Millcreek Mall, 567 Millcreek Mall, Erie, PA 16509. The Fresh Healthy Café will be open Monday to Saturday 10am to 9pm and Sunday 11am to 6pm.